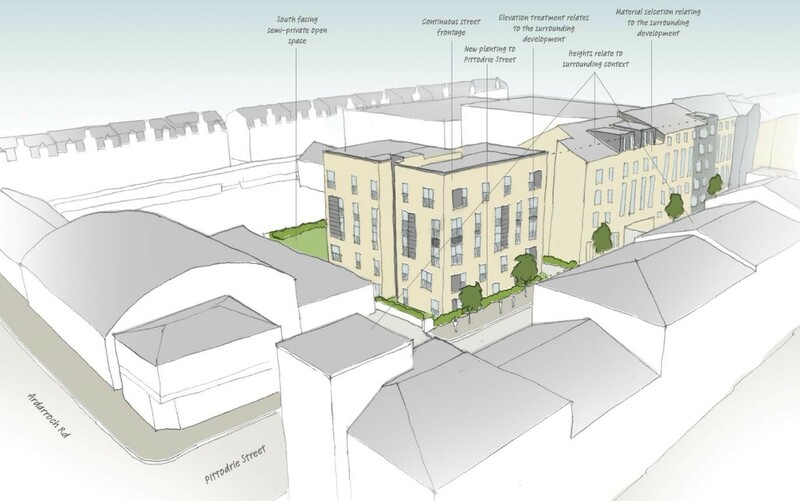 Aberdeen’s Pittodrie Street has been earmarked for 15 affordable homes with the emergence of a planning application for the urban brownfield site authored by Halliday Fraser Munro Architects. Located due east of a new student accommodation project, currently under construction, the plot is currently in use as a site compound for construction but was latterly in use as an industrial warehouse. 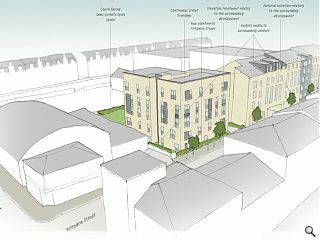 This will be filled with a five-storey block, establishing a continuous street frontage with new and existing properties. In their planning statement the architects wrote: “The main elevation addressing Pittodrie Street is expressed with a base, middle and top which has been created by the positioning and grouping of the windows. The base windows are typically smaller openings punched into the brick walling; the middle windows group together vertically and the top windows revert to the smaller opening size. The windows have also been staggered to enhance this relationship as well as to reduce the vertical emphasis of the building. The homes have been brought forward on behalf of client William Nicol. Is it just me, or does anyone else only see the 'middle' of the 'expressed with a base, middle and top'? Why call it something that it absolutely clearly is not?